Ryder Fleet Products invites all truckers to share photos of their truck’s American décor with us. 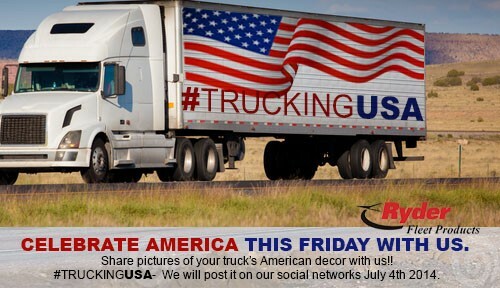 Upload your patriotic truck photos to win! Those in the trucking industry aren’t always able to be home for the 4th of July fireworks, picnics and parades. But they can celebrate on the road by proudly showing their red, white and blue as they travel along. On the road or off, in a parade or on your driveway, show us how you deck your truck out to celebrate America’s birthday. You may submit as many photos as you like – the more you share, the more everyone gets to enjoy. Maybe your ideas will give your fellow truckers some American truck “decoration-inspiration” for the next 4th of July. You may only submit photos of your own truck. Please limit photo file size to 3mg. Ryder Fleet Products reserves the right to post only the photos they choose. We may not necessarily post all photos received. By submitting your photo, you give Ryder Fleet Products the right to use the photo in our promotional material. We look forward to seeing your photos, your trucks and how you celebrate the fourth. Our favorite photo will win a laptop backpack (Retail value: $59.95) and, of course, some pretty neat bragging rights. Shop Ryder Fleet Products for your heavy duty, medium and light truck parts. We also carry shop supplies such as this red, white and blue Streamlight US Flag style LED stylus. Useful for checking under the engine, looking through the cab for items and inspecting hard-to-see places like the bottom of your picnic basket during the fireworks show. SUBMIT YOUR PHOTO. Contest is closed and we are no longer accepting photo submissions for our Celebrate America photo contest. Please join us for another photo contest soon! This entry was posted in Uncategorized by ryderfleetproducts. Bookmark the permalink.